What is Serum Response Factor? Serum response factor (SRF) is a transcription factor that plays a key role in the transduction of mechanical signals from cytoplasmic actin and the extracellular environment, to the cell nucleus. It is highly conserved from yeast to humans and plays a role in a large number of mechanotransduction pathways. It has been estimated that the transcription of as many as 300 genes is under the control of SRF signalling , and of these, more than 200 are directly targeted by the protein . With multiple pathways interacting or converging on SRF, it is considered central to mechanotransduction. NF-kB, zyxin/paxillin, integrin, E-cadherin, Wnt, TGFβ signaling pathways, all represent upstream components of SRF signaling, and as a result, SRF regulates actin-related genes, muscle type-specific genes (i.e., cardiac, smooth, skeletal), as well as genes related to cell survival and apoptosis. Multiple pathways interact or converge on SRF, which regulates actin-related genes, muscle type-specific genes, and other genes related to cell survival and apoptosis. SRF activation is directly correlated to cytoskeleton dynamics, and in particular, the levels of globular- and filamentous-actin (G- & F-actin) in the cytoplasm, which are determined by the level of actin filament assembly and disassembly, or actin treadmilling. Studies that over expressed actin mutants, suggest that it is the concentration of free G-actin, rather than the G:F-actin ratio, that directly affects SRF activation . Importantly, SRF does not directly interact with actin, and is instead activated by one of two classes of cofactors. Specifically, myocardin-related transcription factors (MRTFs), including myocardin itself , and ternary complex factors (TCFs)  . The former is dependent on signaling from the Rho-actin pathway , whereas TCF requires phosphorylation by the MAP kinase pathway. Importantly, these two cofactors compete with each other for mutually exclusive interaction with SRF . SRF localizes to the nucleus in homodimeric form, and once activated by either an MRTF or TCF, will bind with high affinity to the palindromic DNA sequence CC(A/T)2A(A/T)3GG, which is present in the promoter region of each target gene. This sequence is also known as a CArG-box, a C A-rich G –box, or an SRE serum response element . Despite the large number of SRF target genes, they can generally be grouped into a small number of groups based on their function. Those genes that encode proteins that are involved in the G0-G1 transition of the cell cycle are mostly regulated by the Ras pathway, and in these cases SRF will be activated by a TCF. . However, genes which encode muscle specific proteins involved in contractile functions, cell motility and actin dynamics seem to be regulated by the Rho-MRTF mediated activation of SRF. Actin-related SRF-regulated gene products can be further grouped into structural proteins (e.g., actin, dystrophin, myosin, vinculin), effectors of actin turnover (e.g., cofilin, gelsolin) and regulators of actin dynamics (e.g., talin, filamin) . With the CArG-box present in the promoters of many muscle development and growth related genes  and with a fundamental role in the regulation of genes related to the actin cytoskeleton , SRF is integral to the cells ability to sense and respond to mechanical cues from its environment. 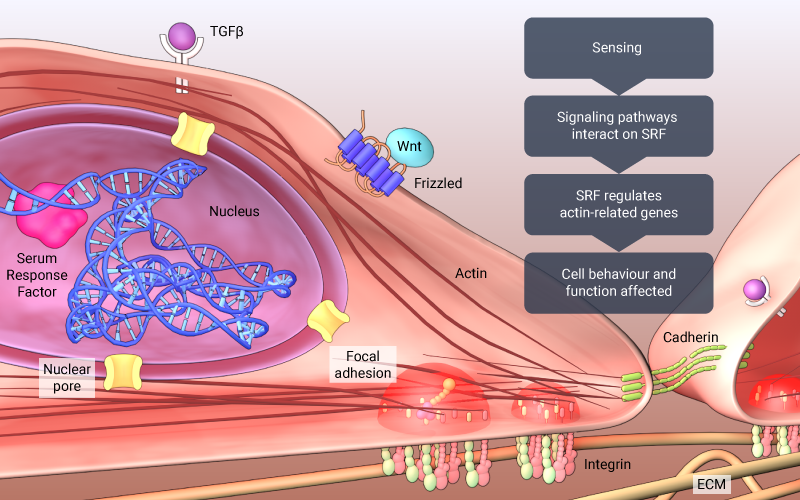 SRF-signaling has been implicated as a major pathway in the direct regulation of genes responsible for stem cell fate regulation , rigidity sensing , inflammatory migration of immune cells  and morphogenesis . A review by Tyler and Halene suggest a de novo synthesis of actin and other cytoskeletal proteins is mediated by SRF signaling during the trans-epithelial migration of immune cells . Abnormalities observed in the cytoskeleton of Srf-null embryonic stem cells  suggest that SRF is an important regulator of cytoskeletal dynamics. Park et al. have shown that smooth muscle cells (SMC) specific Srf knock-out is embryonic lethal in mice due to severe defects in gastrointestinal and cardiac developments.